Being a local, secure, and high-quality alternative to global online shopping websites such as Amazon and eBay, BuyAbans is the one-stop shop for the most popular brands in the world for consumer electronics. 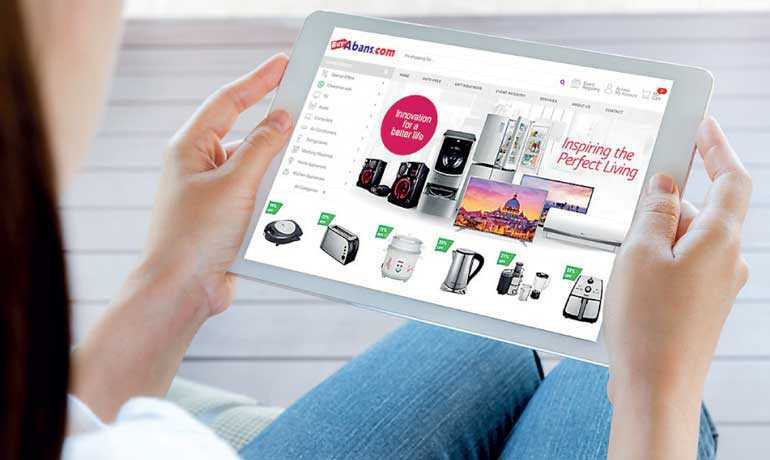 Hosting unparalleled services and user-friendly features, buyabans.com gives you the power to pick and choose from a diverse variety of world-renowned brands, including LG, Hoover, Toshiba, JVC, Haier, Electrolux, Apple, JBL, Philips, and Frigidaire. BuyAbans is the only place where you can get the best prices, offers, and deals along with unmatched after-sales services in Sri Lanka. The recently revamped website includes an easy-to-use web navigation system that lets you search for products under a specific category. For instance, on the navigation bar, you can simply click on the ‘categories’ link to generate a drop-down menu that will allow you to choose your preferred product category. Plus, BuyAbans provides extensive search customisation tools, which enable you to personalise your search according to product type, brand, and price range. The website is accessible from any device of any screen size. BuyAbans also makes online purchase decisions easier by providing detailed features, realistic images from every angle, and informative product videos. BuyAbans further offers other components that meet your diverse lifestyle needs. You can purchase gifts or vouchers for your loved ones by clicking on the ‘gift’ link, filling out a specific gift item/voucher value in the generated form, and selecting your preferred delivery method. This allows you to send your loved ones gift items or vouchers, even when you are overseas. In addition, you can reserve your products at Abans Duty Free to be purchased upon your arrival in Sri Lanka from anywhere in the world through the BuyAbans website. Moreover, you can partake in exciting daily promotions and weekly flash sales, and attain incredible discounts, sometimes even up to 50% off, on a vast variety of products ranging from refrigerators and washing machines to television sets and home theatre systems. BuyAbans accepts any credit, debit, and master card payment as well as fund transfers and bank deposits, whilst providing an encrypted online payment gateway that makes purchasing your products highly safe and secure. We partner with all leading banks to provide customers interest free instalments up to 60 months. So, upfront payments are not always required. BuyAbans offers free island wide delivery for each of your purchases which lessens the strain on your wallet, requires no additional costs, and lets you experience more convenient, hassle-free delivery that brings your purchased items right to your doorstep. Beware of other upcoming websites that purport to offer LG and other brands which are sold exclusively at Abans. These sites usually do not last for long in the Sri Lankan market, and distribute fraudulent products that easily breakdown and expire within a short period of time. They also do not possess adequate experience in providing after-sales services for the products you buy, which means that you will be purchasing inferior or fake items without any guarantee of service support. The only website that truly offers legitimate and original branded products is buyabans.com. BuyAbans possesses the genuine spare parts required for any kind of product repair or service as well. Thus, it is always best to buy your favourite products from BuyAbans, Sri Lanka’s No. 1 online expert for electronics. So, take part in a non-stop shopping spree in the comfort of your own home by logging onto buyabans.com today!